This report is from the UK and deals with their outbound tourism. But it is loaded with things to think about when trending what will happen to visitor centric economic and cultural development for communities. It is a little dated in that it still refers to tourism as an industry. Long ago, tourism was recognized as a sector of the economy, involving six or so different industries. But for the most part the report just uses the term travel and tourism. Whether the appeal of travel destinations (in this case overseas but applicable to domestic) and consumers’ sensitivity to the environmental impacts of travel makes tourism more or less viable. 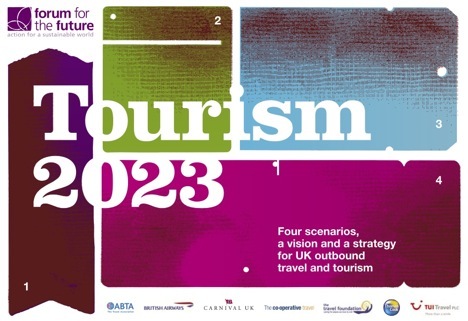 Going beyond most reports of this type, Tourism 2023 culminates with how individual organizations like destination marketing organizations like DCVB at the community level can use and adapt these scenarios.